Product #18704 | SKU LP36260 | 0.0 (no ratings yet) Thanks for your rating! 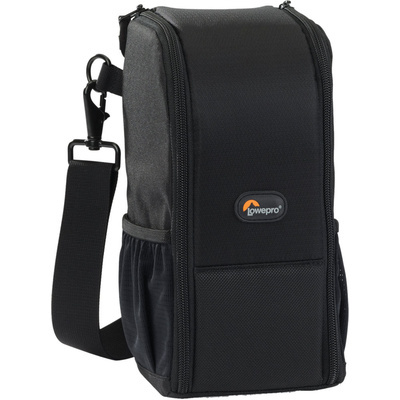 The Lowepro S&F Lens Exchange Case 200AW (Black) is designed to carry up to a 70-200mm lens f/2.8 lens. The case is made with a lens exchange design that allows user to take out the lens with one hand. It increases ease of operation and lens exchange speed. The dual-compartment design temporarily holds 2 lenses for that lens-changing moment; collapses back to a single-lens shape once lenses are exchanged. There are 2 mesh side pockets that have easy-to-reach storage space for lens cap, body cap, filter, etc. It has a built-in All-Weather AW Cover that protects the case from the elements. The 200AW case has an easy and fast access wide opening. There are 2 mesh side pockets that have easy-to-reach storage space for lens cap, body cap, filter, etc. The case uses a SlipLock attachment tab that allows the pouch to be worn on a compatible S&F belt or other Lowepro SlipLock product. It is carried by an Easy-grip handle or a removable, adjustable shoulder strap.